To ask other readers questions about A Wonderful Stroke of Luck, please sign up. The writing really flows in the first half of this book. But then it seems to stop...nothing seems to be going anywhere. Even though the plot addresses some tragic events, you still don't really feel like anything has happened. The characters feel like they are merely suggestive, it's so hard to engage with any of them. What I enjoyed was Beattie's use of language--she is a master of similes (if there ever was one) and I love some expressive and insightful moments like this one: "The trees were The writing really flows in the first half of this book. But then it seems to stop...nothing seems to be going anywhere. Even though the plot addresses some tragic events, you still don't really feel like anything has happened. The characters feel like they are merely suggestive, it's so hard to engage with any of them. What I enjoyed was Beattie's use of language--she is a master of similes (if there ever was one) and I love some expressive and insightful moments like this one: "The trees were dark shapes that could have been made with enormous cookie cutters." It's her playing with language that I loved, but as a story this was not an easy read. The ending left me feeling empty and confused. I feel I must be missing something, but then stories shouldn't be this hard to get into. She is a master of short stories and I think I will stick with those in my further readings of Beattie. I could not decide on a rating. I’ve been a bit exasperated with the currently fashionable critical focus on “stakes” in books, because it seems to put the focus on plot at the expense of beautiful writing. And then I read A Wonderful Stroke of Luck by Ann Beattie, and all of a sudden, I get it. Because there really is some beautiful writing here, as when Beattie compares a character to “cigarette ash, her grudges tiny, glowing embers waiting to flare” or describes a handshake as “a firm grip with soft skin, like a pillow-top I’ve been a bit exasperated with the currently fashionable critical focus on “stakes” in books, because it seems to put the focus on plot at the expense of beautiful writing. And then I read A Wonderful Stroke of Luck by Ann Beattie, and all of a sudden, I get it. Because there really is some beautiful writing here, as when Beattie compares a character to “cigarette ash, her grudges tiny, glowing embers waiting to flare” or describes a handshake as “a firm grip with soft skin, like a pillow-top bed at an expensive hotel.” But there are no stakes here at all: the book’s campus novel opening—which introduces several students in a boarding school honors club moderated by the supposedly charismatic Pierre LaVerdere, a teacher who his students almost worship, even though nothing about Beattie’s characterization of him merits this—feels at odds with the rest of the book, which morphs into a coming-of-age story about one of these students, Ben, who is a self-described “withholding” person and therefore perhaps not the best choice for a protagonist. It doesn’t help that many of the major emotional events in the book—deaths, a suicide, etc—happen offstage, with the reader finding out about them well after the fact from an offhand comment by one or another character and therefore having no real connection to them. Or that the characters themselves are generally unlikable and unmemorable and, even more problematically, cycle in and out of the book irregularly and somewhat distractingly. (Jasper, we hardly knew ye!) The one constant is Ben, but his meanderings through multiple dead end jobs and relationships are more frustrating than compelling. (And why does Ben suddenly hold a grudge against LaVerdere—not that I blame him!—after being so besotted with him in high school—and well before some plot points involving other characters later in the book give him some legitimate reasons to find him repugnant?) LaVerdere himself makes a late reappearance for no discernible reason and is no less a cipher at the book’s closing than he was at the start. Ann Beattie’s novel is told from the perspective of a young man, beginning with his adolescence in a north-eastern boarding school for troubled kids, and continuing until he is in his mid-thirties, living in suburban upstate New York. While it feels risky for a woman in her 70’s to write from this perspective, it felt largely authentic and I was interested in Ben, his friendships, his relationships with women, and his career. I have to say that I’m baffled by the ending. I turned back the pages o Ann Beattie’s novel is told from the perspective of a young man, beginning with his adolescence in a north-eastern boarding school for troubled kids, and continuing until he is in his mid-thirties, living in suburban upstate New York. While it feels risky for a woman in her 70’s to write from this perspective, it felt largely authentic and I was interested in Ben, his friendships, his relationships with women, and his career. I have to say that I’m baffled by the ending. I turned back the pages of the ebook several times, trying to determine if something had been inadvertently deleted. Ben is an honor student at the elite Bailey Academy where he finds himself part of the honor society led by teacher Pierre LaVerdure. LaVerdere is a capricious advisor who teaches his group of students how to discuss topics, with both reason and deception. 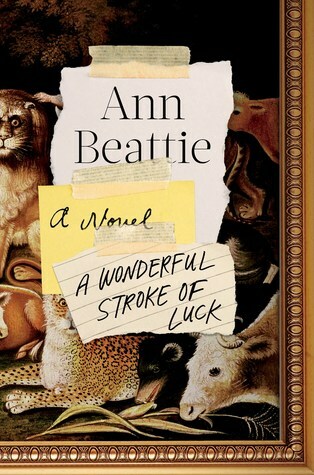 As Ben moves aimlessly on after graduation, eventually to college, and in and out of relationship A Wonderful Stroke of Luck by Ann Beattie is a recommended/so-so novel following a disaffected young man through his coming-of-age into adulthood. 3.5. I love Beattie's stories and this is the first of her novels I've read. I did enjoy it, even when it felt a little listless, and I thought Ben-and perhaps this was purposeful-was the least interesting character, which is a tough role for the protagonist, and unless the secondary characters are wildly fascinating, it's tough for the reader, too. Key West is discussed, though, which always fun. Ann Beattie, what's happened to your writing? You were a short story writer extraordinare -- until the publication of "The State We're In" a few years ago. And now this insipid novel with its banal characters and lame plot. The uninformed reader would not recognize the book as being written by the same author who crafted "Chilly Scenes of Winter" and "Walks with Men". Sometimes the well runs dry, even for great writers. Please stop while you're ahead. First world problems going nowhere. I have read a lot of this authors stuff and loved it. Kept reading this one despite not knowing where it was meandering. There is so wonderful writing in it. Hence two stars rather than one. I've been a Beattie fan for most of her career, but this one didn't appeal to me much. I had trouble identifying an actual plot and didn't connect much with characters. May be more appealing to a younger audience. Beattie fans know that she's wonderful with language. That's true for this novel as well. Regrettably, the plot didn't grab me. It felt stale in a way that surprised me. Thanks to the publisher for the ARC. While I did not enjoy this, I'm sure others will. I had trouble staying interested in the book. Really did not like the characters. I won this book through goodreads. Why did this have good reviews? I couldn't even finish it, it was so tedious. If only I could give negative stars. Run back to the store and return this, don't even start it!